Originally published by Pagan Publishing in 1997, twenty years on, Arc Dream Publishing is updating Delta Green: The Role-Playing Game, ‘A Role-Playing Game of Lovecraftian Horror and Conspiracy’, its take upon modern Lovecraftian investigative horror, to a post-War on Terror, Trump-dominated, divided world. A taster of the setting as well as a scenario and a Handler’s Screen were provided in Delta Green: Need to Know. The roleplaying game consists of two books, Delta Green: Agent’s Handbook and Delta Green: Handler’s Guide. The first of these presents the core rules and the background to the game’s investigators—or Agents as player characters are known—whilst the second presents the greater background, the secret, but unfortunate true nature of the world and universe which will ultimately drive those exposed to it insane and cause them to lose their humanity. The Agents are primarily members of United States law enforcement agencies, such as the Federal Bureau of Investigation or Immigration and Customs Enforcement; the Department of Defense, such as the U.S. Army Medical Research Institute of Infectious Diseases or 318th Cyberspace Operations Group; intelligence and diplomatic agencies, such as the Central Intelligence Agency or the Department of State; and public safety agencies, such as the Centers for Disease Control and Prevention or the Environmental Protection Agency. Some are civilians, typically specialists of one kind or another not usually employed by the US government. What they have in common is that they have been co-opted into Delta Green, a covert group within the United States federal government tasked with investigating, containing, and concealing unnatural threats and events which are a danger to the United States, let alone the world. They work off budget, hiding it within normal expenses; they do not know who leads the group—indeed they are unlikely to meet Delta Green members other than their fellow cell members and their briefing contact; and they keep what they discover a secret—and they suffer for it. The consequences of their facing the unknown will corrode their sanity, and consequently disrupt their mental wellbeing and both their professional and personal relationships. Delta Green is a roleplaying game whose themes are investigation and uncertainty, suspense and horror, violence and moral choices, sanity and comprehension, keeping secrets, and personal and professional consequences. What it is not, and this despite its origins, is a roleplaying game of investigating the Cthulhu Mythos. Rather, it is one of investigating the Unnatural, that which is not natural to the fragility of the human psyche—and sometimes the human body—but in fact reflects the true nature of the cosmos. It is also a game of covering it up and containing it, lest the world at large is exposed to its corrosive effects. To an extent, this is made easier by the fact that the Unnatural is rarely encountered, but lethal when it is, and in the main, because humanity is jaded enough to not believe the stories of its existence. Of course, the Handler—as the Keeper is known in Delta Green: The Role-Playing Game—as well as veteran players of Delta Green and other roleplaying games of Lovecraftian investigative horror, will recognise many of these elements as being of the Cthulhu Mythos. The latter though, is not a term used in the Agent’s Handbook, where hints as to the nature of the Unnatural are shifted to the documentation and reports which appear in the book’s stunning illustrations. Fundamentally, this shifting of the Cthulhu Mythos to the Unnatural represents an attempt to mystify and occlude the races and entities from the writings of H.P. Lovecraft and others—at least from the point of view of both player and Agent. In Delta Green, characters or Agents are defined by six statistics—Strength, Dexterity, Constitution, Intelligence, Power, and Charisma; derived attributes which represent their mental and physical strength; a Profession, what an Agent does as a job and what skills they have; skills—their training and their education; and their Bonds, the ties they have professionally and personally which keep them grounded in the natural world. Every stat has derived value—equal to five times its value—to roll against when using it directly and stats under nine or over twelve also have a distinguishing feature. An Agent also has Bonds—personal connections—that tie him to the natural world that to some extent will bolster his ability to withstand the ‘Unnatural’, but yet will suffer as consequence. In terms of skills there are relatively few changes, most of which to reduce the number of skills to choose from. So Alertness covers perception-based skills like Spot Hidden and Listen, Firearms covers guns, and so on. For obvious reasons, there is Cthulhu Mythos skill, it instead being replaced by the Unnatural skill, which covers all “Things Man Was Not Meant to Know”. In addition to skills, Agents can have special training, such lockpicking, parachuting, or SCUBA diving, each tied to an existing skill, or in some cases, a Stat. To create an Agent, a player either rolls his Agent’s Statistics (roll four six-sided dice, drop the lowest, and assign freely), divides seventy-two points between the six Statistics, or choose from one of the sets of numbers included in the Agent’s Handbook. After determining the derived attributes, a player picks a Profession. The most obvious Professions for Delta Green are Federal Agent, which can represent working for any one of a number of United States government federal agencies, and Special Operator, representing a member of the United States’ special forces. Both the agencies and special forces are detailed later in the Agent’s Handbook, allowing both player and Handler to detail their Agent’s professional life and background. Only a few of the Professions can be described as being classically Lovecraftian, the others are all very modern. Skills provided by Professions are set values, as are the Bonus Skill Points a player can assign. A player is free to assign the eight Bonus Skill Points or can choose any one of the optional Bonus Skill Point Packages, each representing specific training or previous training, from Artist, Actor, or Musician, Athlete, and Author, Editor, or Journalist to Soldier or Marine, Translator, or Urban Explorer. Besides this a player needs to decide on his Agent’s Bonds—essentially the more time consuming the job, the fewer bonds available, Motivations, and if playing a veteran of the covert group, then the reason for being co-opted into Delta Green. This is a traumatic incident in their past such as Extreme Violence, Imprisonment, Things Man Was Not Meant to Know and so on. Each is mostly traumatically deleterious to an Agent’s stats, though there may be some minor bonuses too. Overall, the creation process is relatively quick, mostly a matter of making choices and assigning set packages of points. The result is that an Agent looks not dissimilar to an Investigator, the same attributes being used as statistics, although Size is not used. Mechanically, Delta Green: The Role-Playing Game employs a percentile system—no surprise given that it is derived from the Basic Roleplay System, but it keeps its mechanics even simpler. Penalties and bonuses rarely amount to more than a flat -20% or +20% and when it comes to a Luck roll, an Agent has just a flat 50%. In Delta Green it is not a derived value. Combat is noticeably deadlier with many weapons having a flat Lethality rating in addition to the damage they ordinarily do. For example, a short burst from a submachine gun has a Lethality rating of 10%, whilst a grenade has a Lethality rating of 15% in a 10 metre radius. Roll under this and an Agent or the target—if human—is dead. Not even Body Armour protects against this, though cover will. Even if failed, the results of the percentile rolled for the Lethality check are added together and applied as damage, rather rolling individual damage dice. It can thus be very deadly, so Delta Green: The Role-Playing Game is not designed to be a combat focussed game. It plays a role, but its lethality should ideally encourage players to be as cautious as their characters are probably trained to be. As befitting a roleplaying game of Lovecraftian investigative horror, Delta Green: The Role-Playing Game has rules for Sanity, including loss and recovery. In comparison to other roleplaying games of Lovecraftian investigative horror, those here are both complex and nuanced. An Agent can suffer Sanity loss from both suffering and inflicting violence and from a sense of Helplessness as well as the Unnatural. When an Agent suffers a loss of five points of Sanity in one encounter, Temporary Insanity occurs, simply triggering a ‘flight or fight’ response and lasting only a few minutes. If an Agent loses Sanity enough to fall below his Breaking Point—essentially when the terror or stress has become too much, equal to Sanity minus his POW or Willpower—he can acquire a Disorder which will develop later. The nature of the Disorder is determined by the source of the Sanity loss. So PTSD from Violence, Anxiety Disorder from Helplessness, Depersonalisation Disorder from the Unnatural, and so on. Should an Agent lose Sanity or encounter a traumatic trigger related to his Disorder, an acute episode of it can occur. However, in Delta Green, there are ways of preserving an Agent’s Sanity. Willpower can spent to reduce to Sanity loss, but at the same this reduces the value of an Agent’s Bonds, reflecting the loss of and connection to humanity represented by the Bonds. An Agent can adapt to sources of Sanity loss from Violence or Helplessness, but whilst this makes him immune to such losses, he also becomes more inhuman. Willpower is a finite resource, but it can be regained through rest, fulfilling a motivation, and so on. Personal pursuits away from an assignment enable an Agent to strengthen a Bond, undergo therapy and regain Sanity, improve a Stat or skill, and so on. A disorder can also be overcome, but it takes time and it never truly goes away—trauma or severe Sanity loss can trigger it again. In general, the Sanity rules in the Delta Green: Agent's Handbook reflect the wider effect of Sanity loss and the place of each Agent’s place in the world. This is continued with the guide to ‘Home’. Just a few pages long, this explores what might happen to an Agent once he has returned from a Delta Green mission. Each player is expected to roleplay a scene exploring how their Agents have been changed by what happened on the mission, but are then given the opportunity to deal with any sanity loss, perhaps by going on retreat, fulfilling responsibilities to Bonds and personal relationships, entering therapy, working to improve a skill or Stat, and doing special training. Alternatively, an Agent can study a previous case or the Unnatural! This is likely to result in a Sanity loss, of course. Worse, an Agent might get fired or prosecuted as the result of a Delta Green mission and this is also covered. Although these Sanity rules add a complexity in comparison to other roleplaying games of Lovecraftian investigative horror, they also add nuance and subtlety, and they add opportunities for the players to explore the consequences of their Agents’ actions. The Bonds definitely serve to make the rules for Sanity in Delta Green: The Role-Playing Game more than just numbers and to provide good hooks for roleplaying. The Agent’s Handbook provides not just the physical details on the equipment and the vehicles that an Agent might be able to obtain, but also how to get them—either by purchasing them or requisitioning them. This can be very difficult as the funds an Agent may officially have access to may be fairly limited and the ability to hide expenses or obtain other sources of funding makes the Program Manager Occupation and the Accounting skill a whole lot more important and a whole lot less dull. Money is treated as an abstract, as a series of expenses ranging from incidental and standard up to major and extreme. The tools of the trade are covered for most types of Agents, as are weapons, armour, vehicles, surveillance, breaking and entering, survival, and communication devices and computers. A range of services is also detailed. Perhaps a third of the Agent’s Handbook is devoted to the agencies, departments, and regiments that an Agent can belong to. Delta Green was always renowned for the fact that it set high standards in its treatment it gave the alphabetti-spaghetti federal agencies. The Agent’s Handbook not only meets those standards, but exceeds them. For each agency, department, or regiment, it explains its jurisdiction, whether it can enforce laws and what they are, how it is organised and how it operates, any areas of friction, and how to play a member of the organisation. Various Occupations are also listed for each agency. The ten agencies covered are the Centres for Disease Control and Prevention, the Central Intelligence Agency, the Department of Defence—including the various military service branches, the Drug Enforcement Agency, the Environmental Protection Agency, the Federal Bureau of Investigation, Immigration and Customs Enforcement, the Department of State, the US Marshals Service, and US Special Operations Command. Previous versions of Delta Green provided information about a far greater number of agencies, but not necessarily in great detail. Here, the agencies are afforded greater detail—some three or four pages each—the result providing more information about playing a member of each, how they operate, and so on. Not only is this background much more playable than before, it also provides a good overview of the US federal investigative landscape. Rounding out the Agent’s Handbook is a set of appendices. These give an introduction to tradecraft with accompanying mechanics for surveillance, pursuit, interrogation, disposal of body, and Delta Green’s infamous ‘Green Boxes’, the latter being cell’s storage facilities and boxes for anything and everything from weapons and corpses to medical supplies and evidence of the Unnatural. Glossaries lists terms for equipment, persons, information/misinformation, locations, operations, and so on. All useful facts and procedures for playing characters who have specific professional information and skills that the players probably lack. Physically, Delta Green: Agent’s Handbook is a superbly professional hardback. The writing is clear and easy to understand, its treatment of its subject being matter of fact and straightforward with barely a hint of the Unnatural. Where the Unnatural creeps into the book is the fully painted artwork and the faux documentation of Delta Green operations. The latter are a horrifying read in themselves and they could easily form the basis of handouts ready to unnerve a Handler’s Agents and their players. 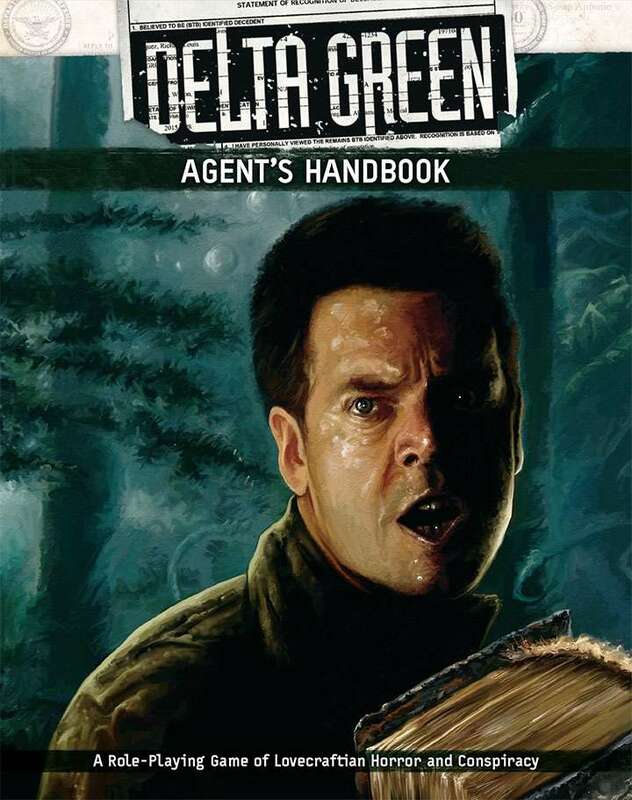 The Delta Green: Agent’s Handbook provides a superb resource for both player and Handler for roleplaying modern conspiracy and Lovecraftian horror scenarios and campaigns that is Delta Green: The Role-Playing Game. The first with some well written background the US intelligence and federal agency landscape, the latter with the nasty nature of the Sanity rules, which very effectively show off the corrosive effects—and more importantly, the consequences—of encountering the Unnatural. What is amazing is that it does so when only hinting at the terrible nature of the Unnatural via the book’s art and in-game documentation. 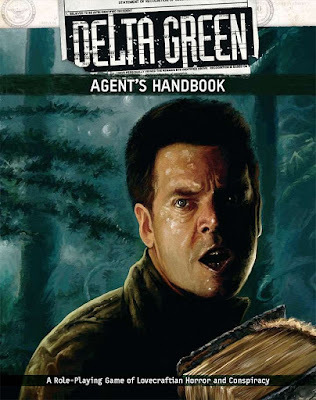 In updating it to the modern day, the Delta Green: Agent’s Handbook brings lethality and a grim and gritty tone as well as PTSD and depression home to Lovecraftian investigative horror, whilst saving the Unnatural for the Handler’s Guide.